Off-Road Vehicles (ORVs) Market size was valued at over USD 19.5 billion in 2017 and is estimated to exhibit around 5.5% CAGR from 2018 to 2024. 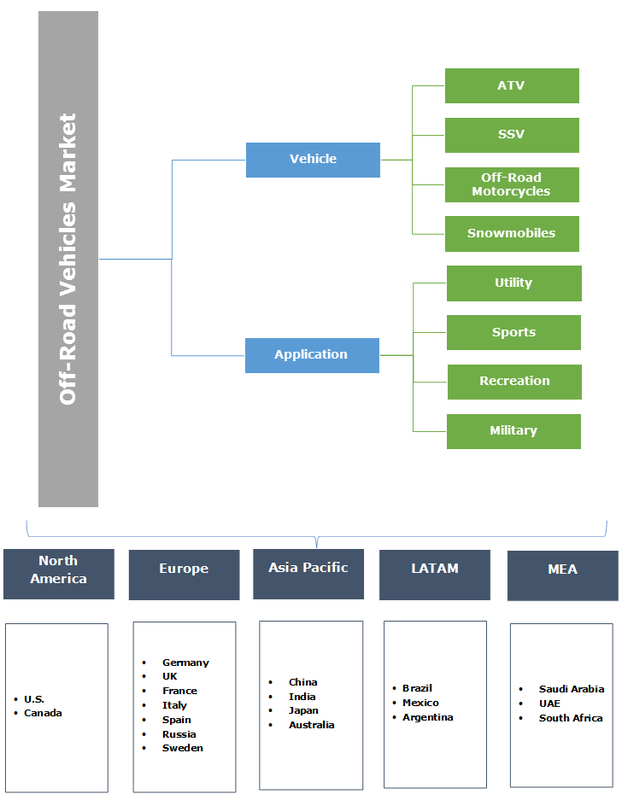 Rising recreational and sports activities across the globe will drive off-road vehicles market during forecast period. Growing urban population in conjunction with increasing youth inclination towards motorsports activities will enhance product penetration. Countries including the U.S, and Australia are taking initiatives to proliferate outdoor activities such as hunting and trail driving. The U.S. Recreation Department offers over 150,000 miles of trails and around 440 wilderness areas, attracting participants, thereby enhancing the market share from 2018 to 2024. Improving economic conditions along with increasing discretionary spending and credit availability are positively influencing off road vehicle demand. Market players including Polaris, and Kawasaki are introducing low cost models to attract more enthusiasts. New technological developments including GPS tracking and mobile tracking to improve driving experience will boost industry growth. Increasing population is positively influencing agricultural and construction activities across the globe. The ORVs including ATV and SSV have tough bodies and can easily perform in rough and rugged terrains. Superior advantages offered including enhanced four-wheel drive technologies with differential locking system, enhanced traction, stability, and power/torque stimulates the off-road vehicles market growth over the study timeframe. The Environmental Protection Agency (EPA) regulates the various aspects of the off-road vehicles including chassis exhaust emission testing procedures, evaporative emission standards & test procedures, emission standards & certification requirements, exhaust emission test procedures and general compliance provisions. This will enable manufacturers to introduce innovative technologies to improve the overall efficiency, positively influencing the off-road vehicles market size over the forecast timeframe. Introduction of electric drivetrains is providing a positive outlook for the industry growth. These electric models offer enhanced efficiency, thereby contributing less towards carbon emissions and compliance with the governments emission standards for recreational activities. Rising number of accidents owing to improper driver training and non-usage of safety equipment will hamper the industry growth over the forecast timeframe. For instance, in 2017, according to the Consumer Federation of America, total number of ATV fatalities were 349 in the U.S. Speciality Vehicle Institute of America (SVIA) in the country regulates and promotes the safe driving of ATVs in the country. The organization lays regulations prohibiting the usage of ATVs on public roads providing confidence to consumers escalating the off-road vehicles market demand till 2024. The Federal Chamber of Automotive Industries (FCAI) along with the Australian Competition and Consumer Commission (ACCC) lays down requirements and formal procedures for the mandatory Crush Protection Devices (CPDs) on the off-road vehicles. The organisation also mandates the compulsory wearing of safety helmets and proper training for driving these rugged vehicles providing a positive outlook for the industry growth. High acquisition cost coupled with enhanced power and torque output by the rugged off-road vehicles will hamper the industry growth. The presence of complex drivetrains, large tires and four-wheel drive systems negatively affects the performance efficiency thereby limiting the overall off-road vehicles market size expansion over the projected timeframe. ATV segment will witness around 3.5% CAGR from 2018 to 2024 owing to the enhanced performance abilities to travel in diversified terrains including desert areas, concrete roads, rugged terrain, and grasslands. Availability of several drivetrain alternatives with multiple configurations will further support the segment growth over the forecast timeframe. SSV/UTV segment will hold around 45% revenue share in 2017. This dominance can be attributed to the added advantages offered, including rollover protection bars, ability to seat multiple passengers, storage facilities, and improved mobility. Availability of safety features including seatbelts, roll-cage, windscreen will fuel the off-road vehicles market share over the study timeframe. Sports application segment will witness significant gains at over 4.5% over the forecast timeframe. This can be credited to the rising power sports activities and their popularity among consumers across the globe including motocross, autocross, and rallycross. Proliferating racing events including BAJA will provide solid growth platform for the off-road vehicles market size till 2024. Recreation segment will account for a volume share of approximately 25% till 2024 owing to the increasing usage of ORVs for leisure and touring activities. Continuous improvements for enhancing off-road vehicles efficiency along with the introduction of electric drivetrain will positively influence the segment growth till 2024. For instance, in August 2018, DSRaider developed the EZRaider line of electric ATVs with enhanced mileage and ability to travel through diversified terrains boosting the off-road vehicle market share over the study timeframe. Asia Pacific market share will account for over 10% volume share of by 2024. Increasing off-road activities and rising preference for off-road motorcycling and dirt bike events are among the major factors contributing to the regional growth. Sports events conducted by the International Automobile Federation Asia will further boost the regional dominance over the projected timeframe. Off-road vehicles market players include Arctic Cat Inc, Kubota Corporation, Polaris Industries Inc., Honda Motor. Co. Ltd, Deere & Company (John Deere), Kawasaki Motors Corp, Suzuki Motors Corporation, Bombardier Recreational Products, Caterpillar, Yamaha Motor Co., Ltd., Kässbohrer Geländefahrzeug, Wildcat, Tomcar Australia, Massimo Motors and KTM. Industry participants are emphasizing on introducing UTV models with advanced technology and seating configurations for improving their industry positioning. For instance, in August 2018, Caterpillar introduced the advanced Cat utility vehicles CUV85 and CUV105 D powered by gasoline and diesel respectively. These vehicles include second row seating with a total capacity of five passengers. Off-road vehicles industry is gaining momentum across the globe owing to their rugged nature and their ability to travel across difficult terrain, rough, and muddy landscapes. Supervisory bodies including Society of Automotive Engineers (SAE), SVIA, and British Colombia laws regulate the safety aspect and the new registrations. American National Standards Institute (ANSI) defines several standards relating to the ORVs. These include the tire-pressure requirements and other technical requirements for off-road vehicle types. 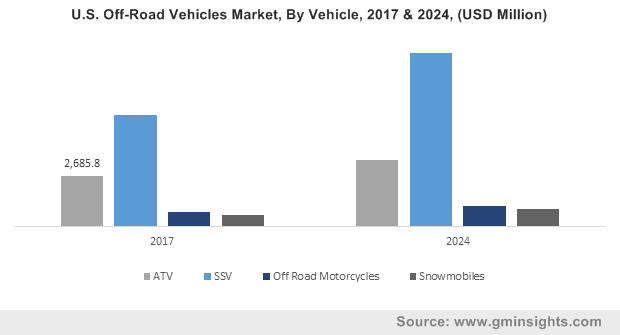 Proliferating usage for leisure and recreational activities across the globe will further strengthen the off-road vehicles market share over the projected timeframe.